Growing up near Los Angeles I have always loved skyscrapers. There’s nothing like standing at the foot of a giant building, looking up and pondering the marvel that it is to erect a such a behemoth. So, naturally, while here in Medellin I’ve visited the cities tallest building a few times and I’ve researched it’s history. The Coltejer building is a staple in the Medellin city skyline. Standing at a towering 175 meters (36 floors) it is the tallest building in Medellin and the fourth tallest in all of Colombia. The speed at which the Coltejer building was erected is a true testament to the Paisa grit and work ethic. Construction of the Coltejer building began in 1968 and finished only 4 years later in 1972. The Coltejer Building was designed by architects Raúl Fajardo, Aníbal Saldarriaga, Germán Samper, and Jorge Manjarres. 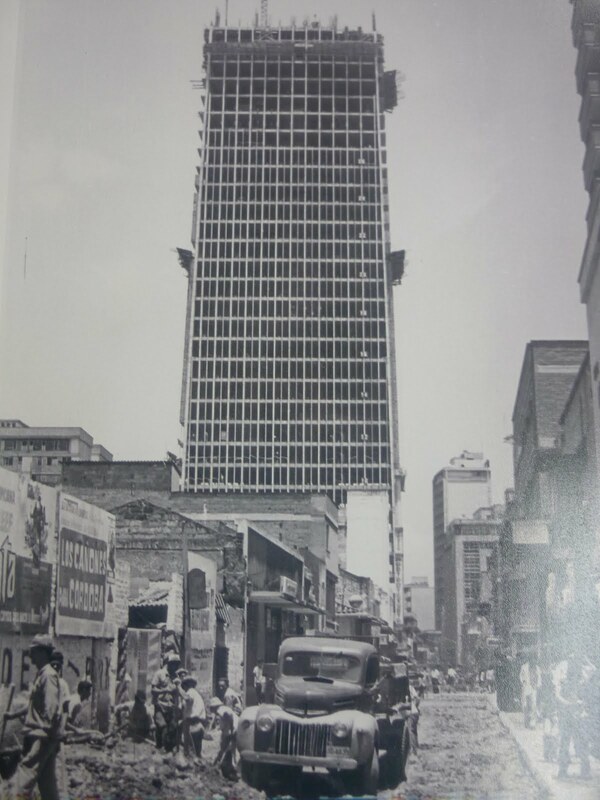 There was a small tragedy in the construction which was that the “Gonzalo Mejia” building had to be demolished in order put the giant building up. Do you know who Gonzalo Mejia was? Gonzalo Mejia was an entrepreneur with a lot of vision. He was a pioneer in Medellin at the beginning of the twentieth century. He was fundamental in the development of airports, roads and even film in Medellin. I love biographies about people like Gonzalo Mejia, there’s a small bio in Spanish here: http://www.banrepcultural.org/blaavirtual/biografias/mejigonz.htm. For more information visit one of the many libraries in Medellin. Col = Colombia, tejer = to sow. Coltejer is one of the biggest textile companies in Colombia and the largest textile complex in Latin America. Coltejer was founded in Medellín by Alejandro Echavarría Isaza on October 22, 1907. Alejandro Echavarria Isaza is also another great story about passion and hard work. Alejandro Echavarria has been deemed the man of the 20th century in Colombia. Here’s a short bio in Spanish: http://www.banrepcultural.org/blaavirtual/biografias/echavarria-alejandro.htm, and again I urge you to visit one of the many awesome libraries in Medellin for more information. The shape of the Coltejer building with its pointed peak, though not intentional, looks like a sowing needle. Where is the Coltejer Building located? The Coltejer building is located in downtown Medellin. The actual address is Calle 52 No. 47 – 42. The nearest Metro station is Berrio. The main cross streets are La Playa and Junin. This intersection is one of my favorite intersections in Medellin. There are street vendors, bakeries, restaurants, casinos, and a lot of foot traffic. On the first and second floor of the Coltejer building you will find a variety of banks, shops and offices including a Western Union (the currency exchange rate is usually pretty good there.) Access to top floors can be granted, but must be with a guided tour.